Along with NetEnt’s creations of Mega Fortune and Hall of Gods, Mega Moolah is one of the most played jackpot slots, which is created by Microgaming. Even though there’s a free spin feature with an added multiplier offered in the slot, the game has a very simple design, both feature wise and graphically. What on the other hand has made Mega Moolah such a popular choice among players is the highest of four different jackpots offered in the game, as this never pays any less than €1,000,000 and where the record amount of €17,8 amazing millions have been won. In addition to the original Mega Moolah slot, there are several different versions of it, such as Mega Moolah Isis and Mega Moolah Summertime. These slots differ in their design and features, but all share the same jackpots. This review will only focus on the original version of Mega Moolah. When you visit the Mega Moolah slot you’re travelling to a scorching hot savanna in Africa. Even though the reels in the game are covering most of the background, there are parts of it showing the savanna, in which a big broad-leaf tree can be seen in the top, desiccated grass in the bottom and an orange colorued sky inbetween. There’s constantly a sound of birds and other wild life in the slot, which somewhat gives a feeling of being on a safari. Even though the design in the game is quite simple, the cartoonish graphic and the lovely smiling animal symbols on the reels make it quite charming. The five reels in the game have three rows to them and 1-25 paylines, where you can choose the number to play with yourself. The stake is adjusted by the number of active paylines, as well as by a coin value between 1 and 50 cent, and a bet level between 1 and 5. With all paylines active, the minimum and maximum stake is €0,25 and €6,25. Should you however only choose to play with one active payline, you could bet as low as 1 cent. Apart from playing on a computer, Mega Moolah can be enjoyed on mobile devices as well, which makes it an excellent choice for those who would like to chase down some huge jackpots while travelling. In Mega Moolah the five lowest paying symbols are represented by the card values 10, J, Q, K and A. These are followed by five high paying symbols, which are all african animals with huge smiles on their faces. You’ll find a happy antelope, a glad zebra, a pleased giraffe, a merry buffalo and a jolly elephant. In addition to this you’ll find a scatter symbol represented by a mysterious purple character with red hair and a wild symbol in form of a lion. The wild symbol substitutes for all symbols, except for the scatter symbol and multiplies all winnings its a part of by x2. It’s also the highest paying symbol should five of them line up in a row on an active payline. Should you be lucky enough to hit the free spin feature, you won’t need any wild symbols to multiply your winnings as all of them will always be multiplied by x3. To trigger this feature you’ll need three or more scatter symbols to appear anywhere on the reels, which will award you with 15 free spins. Apart from the multiplier aspect the free spins are being played as usual. 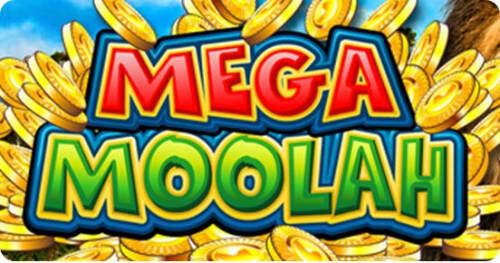 In Mega Moolah the bonus game, where the thrilling jackpots are lurking, is randomly triggered while playing. The jackpots can be won no matter what stake you’re playing with, but the higher the amount, the higher the chance of reaching the jackpot game. When this is triggered you’re taken to a wheel with twenty positions. Ten of them will win you the smallest jackpot, six of them the second smallest, three of them the second highest and one of them the amazing, possibly life changing jackpot. As long as you reach the jackpot game you’re always guaranteed to win one of them. As with the majority of jackpots the ones in Mega Moolah are all progressive. This means that a certain percentage of every bet that you and other players make is added to the jackpots. Because of this the amounts that can be won are constantly changing, but if we take the average amount of all of the highest jackpots that have been won, the payout would be about €5,1 million. On average this is won every 11th week. As the the least amount that can be won from the highest jackpot is €1,000,000, Mega Moolah always offers the opportunity to win huge. The theoretical return to player (RTP) in Mega Moolah is 88,12%.